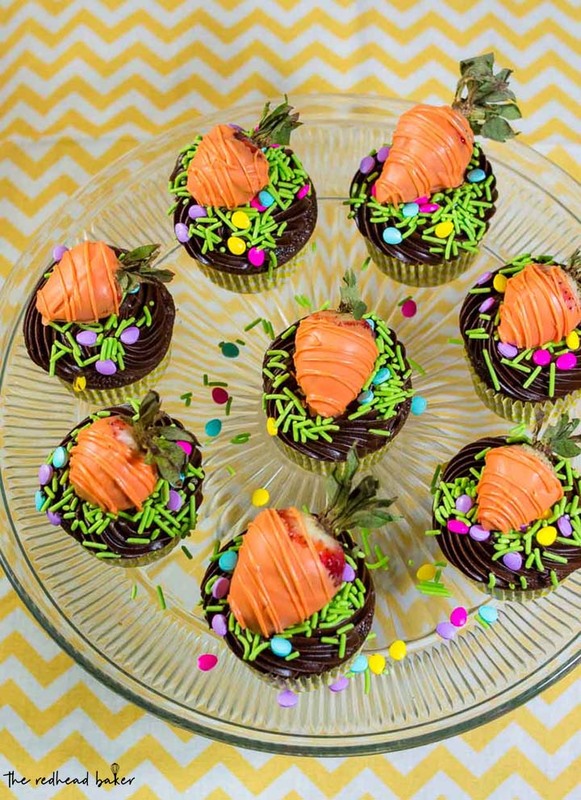 The Easter Bunny will surely stop at your house if you make these adorable Carrot Patch Chocolate Cupcakes, topped with strawberries coated in orange-colored vanilla candy coating. Happy, um, first full day of spring? 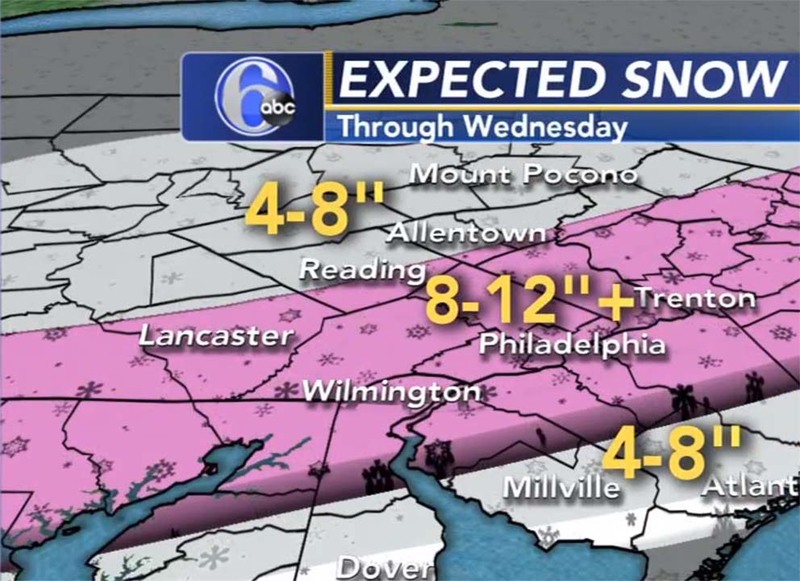 I live in that 8 to 12-inch band there. This is our fourth nor’easter this season! Oh, well, on to warmer thoughts! Easter isn’t too far away, so I’m joining a few other bloggers for #EasterWeek to share recipes for your holiday meal or other spring occasions! 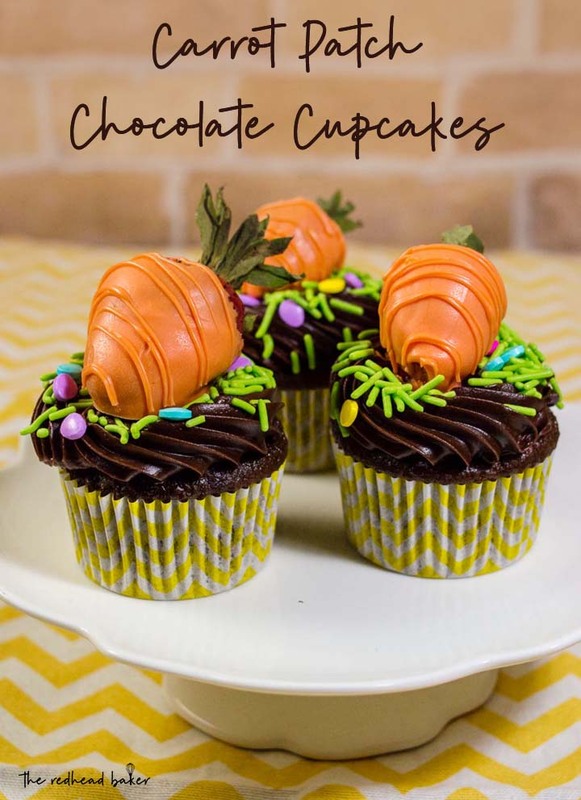 After you’ve checked out my chocolate cupcakes, scroll to the bottom of the post for links to more Easter Week recipes. 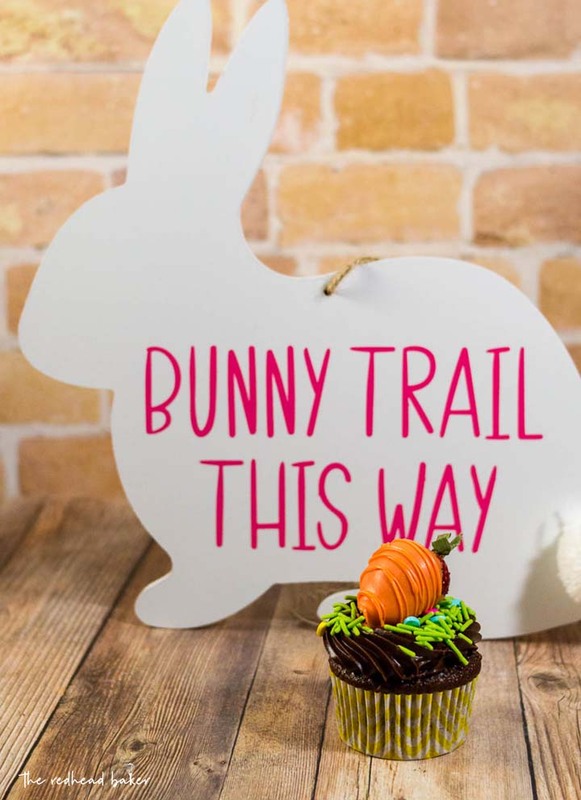 These adorable, easy-to-make cupcakes are perfect for your Easter dessert. The Easter Bunny will surely stop at your house to nibble on one. 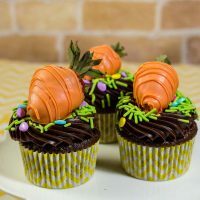 Rich chocolate cupcakes are topped with fudgy chocolate frosting, then topped with strawberries coated in orange-colored vanilla candy coating. “Grass” sprinkles are optional. Vanilla candy coating wafers in a variety of colors are available at most craft stores and online. They are not as finicky as melting chocolate (they don’t seize up if a droplet of water gets into the bowl). The coating will set up (firm up) at room temperature in about 30 minutes or so, depending on a few factors like ambient temperature and the thickness of the coating. To give the “carrots” some texture, I drizzled a few thin lines on top after the initial full coating had set. You can do this with a piping bag, with a heavy-duty plastic sandwich bag, or even just with the tines of a fork. You can use any cupcake recipe (or boxed mix) you like. I went with chocolate cupcakes so the base would resemble soil, and used chocolate frosting for the same reason, and I shared the recipe I used below. It makes 3 cups of frosting, which allows for a generous layer of frosting on each cupcake. I used a closed-star piping tip for my frosting, but you don’t need to do the same. Any method of getting the frosting onto the cupcakes is fine. The “carrots” are the star here! Sift the confectioners sugar and cocoa powder into a large bowl. Add the butter, milk and vanilla. Beat on low speed until all of the sugar is absorbed, then beat on medium-high speed until light and fluffy. Pipe a generous swirl of chocolate frosting onto each cupcake. Set aside. Melt the vanilla wafers in a microwave or over a double boiler. 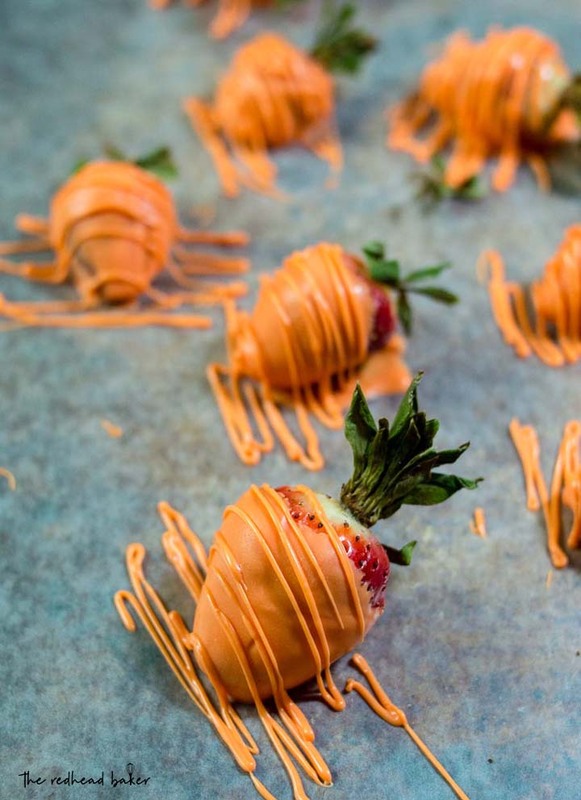 Dip each strawberry in the melted coating, shake off excess, and set on wax or parchment paper to dry. Once dry, use a spoon or the tines of a fork to drip thin lines of melted vanilla coating over the "carrots." Coat each frosted cupcake in sprinkles, and place a "carrot" on each cupcake. Store in an airtight container in the refrigerator if not serving immediately. As an Amazon Associate and member of other affiliate programs, I earn a small percentage from qualifying purchases. I am not a certified nutritionist. This nutrition information is automatically calculated by third party software and is meant as a guideline only. I just saw this as a cake somewhere. Love the cupcakes, such a great idea! Great idea those strawberry carrots! Love these cupcakes, so festive! What a cute way to add strawberries! These are absolutely adorable! Bunny approved! That frosting looks so good! Whenever I have cake or cupcakes, I always want a piece with a lot of frosting lol. And I love how dark chocolatey the cupcakes themselves look.